We got small bottles of Ignis Emollient Nature Milk & Water. Due to my skin condition is not pretty great, I hesitated to use new products, and asked Hazelnuts to have review. Now that the weather is getting (relatively) cooler I felt that it is a good time to try the Ignis Grand Line Emollient Nature Milk. I got a generous 30g sample from Cherry. She initially told me that the Emollient variant is for autumn/winter season and that it might be too rich for my skin type (combination/oily), but nevertheless I told her that I wanted to try it, because of the seasonal changes here in my country, I sometimes get dry patches, and that this product *might* work, even for my skin. There is a “Fresh” version of this line as well, which is suited for summer season. 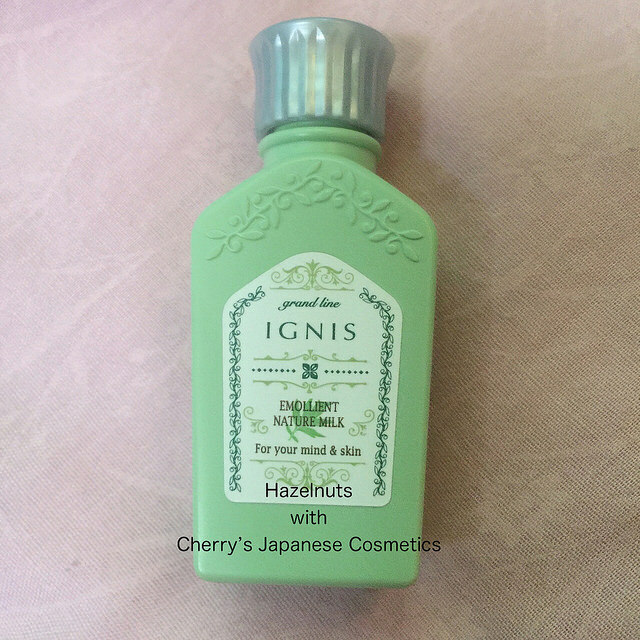 Ignis is also a brand made by Albion, and I understand that it is focused on natural ingredients. Judging from its texture, it’s a rich and thick emulsion that is supposed to be made of oil. What surprised me was that it didn’t feel sticky or greasy when I applied it, but I can tell that it immediately made my skin moist. The scent is herbal and fresh, and quite soothing, especially for night time. The rich emulsion wraps around my skin and makes it soft and comfortable, even when the weather is cold and the air is dry. Because it’s made by Albion, the milk is meant to gain back moisture after washing the face. I find that it does its job quite well. For daytime, I use a smaller amount, which is enough for my combination skin. When skin is moist, makeup holds well and there are no pores or dry patches. Typically, when a product is too rich for my skin, I would break out and have small blemishes. But I did not experience that while using this one. So I do like this milk, I find it soothing, and thick without being sticky. Excellent for when I want an extra boost of moisture. She changes the quantity as her skin condition, and that’s great idea to do, I am sure! Please check the latest price and order from here: “Ignis EMOLLIENT NATURE MILK”, or wanna purchase in Japanese Yen?